It’s certainly less-than-ideal for a team to be up less than four runs in the bottom of the ninth with the bases loaded and an All-Star at the plate. It’s even worse when that All-Star is batting over .400 in the postseason. But that’s exactly where Craig Kimbrel was in facing Alex Bregman late Wednesday night with the Red Sox up 8-6. Bregman swung on the first pitch of the at-bat and Red Sox outfielder Andrew Benintendi put his body, and the game, on the line to end the inning sooner rather than later. It seemed rather fitting that this game ended on such a notable play from the outfield. Just one inning earlier, Mookie Betts threw an absolute dot from right field to get Tony Kemp out as he was trying to extend a single into a double. But even more noteworthy was Joe West’s decision to call Mookie Betts missed catch in the bottom of the first an out because of fan interference, something that will likely enrage Houston fans for years on end. 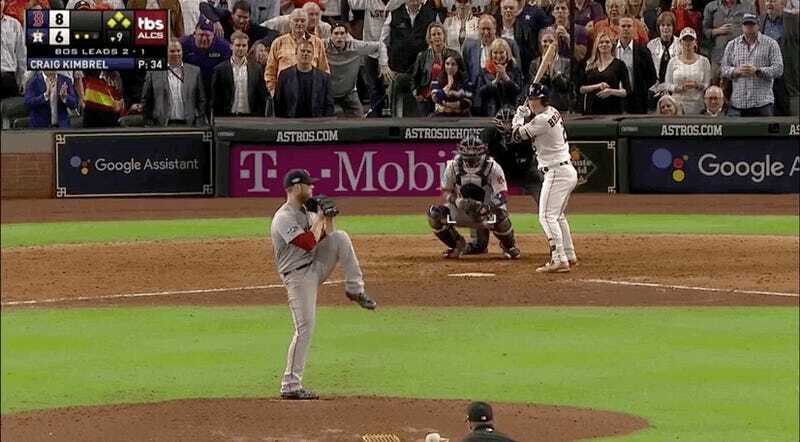 Still, that call doesn’t change other events like Jackie Bradley Jr.’s monster two-run dinger in the sixth, or Lance McCullers Jr. walking Brock Holt in the seventh with the bases loaded. At the end of the day, the best team in baseball is a mere nine(ish) innings away from a World Series appearance and while it’s kind of icky that it has to be the Boston Red Sox, this whole scenario just feels correct.